As the largest builder of sustainable condominiums in Canada, Tridel takes their leadership role and responsibility seriously. That’s why we are committed to building communities that are environmentally responsible, energy efficient and healthy places to live. Tridel leads sustainable residential condominium development in Canada, with more than 20% of the commercial certified LEED® MURB (Multi-Unit residential buildings). * Tridel buildings are designed and built to conserve more energy and resources than standard Code compliant buildings. A typical Tridel buildings conserve more energy and resources than standard Code compliant buildings. A typical Tridel building consumes 34% less electricity, 57% less natural gas and 43% less potable water than a Model Reference Building. Tridel continues to lead the industry in researching and developing innovative technologies with our partnership with Tower Labs. We strive to find the most energy efficiency, highest performing materials and building technologies. Tridel helped change the way people think about environmentally friendly living with the launch of the high-design, sustainable Ecosuite at the Element community in 2007 and then with the 2nd generation Ecosuite at the Reve community in 2011. Today, Tridel has launched NetZed at Aqualina – a home that produces as much energy as it consumes. Learn more at www.netzed.ca. *All LEED® statistics verified by Canada Green Building Council. Tridel is proud to be a 9 time recipient of the Green Builder of the year award by the Building Industry Land Development (BILD). Canadians spend an average of 90% of their time indoors, so the quality of materials and finishes inside a building are extremely important. Green buildings are healthier buildings because they have better air quality by using zero or low emitting materials. The ventilation system is designed to deliver fresh air either directly to your suite or on a continuous basis. Green buildings perform better. This can translate directly into cost savings, as the better equipment, lighting, windows and insulation reduce energy and water consumption. Green buildings are smart, high performance buildings that integrate some of the latest energy and mechanical systems technologies. We integrate the latest in heat recovery and remote, internet-based energy management. Sub-metering even allows the possibility of residents managing their own electricity consumption from their desktops. At Tridel, we are determined to develop condominium residences that meet the needs of today’s homeowners while safeguarding the well-being of future generations by focusing on environmentally sustainable building design and performance in construction, property management and corporate stewardship. All of Tridel’s new buildings are built to LEED® standards. We invite you to visit any of our communities to learn more about Green Condominium Living. We are proud to be making a difference, and we are confident our homeowners feel great about living in their Built Green community. Sustainable site development – How well does the development optimize density and transportation and improve land use, storm water management, and the urban heat island effect? Energy use and atmospheric impacts – Does the building reduce energy consumption by at least 25% compared to Code and are there measures in place to ensure the performance of mechanical systems? Water efficiency – Will the building reduce potable water consumption for domestic and irrigation uses? Materials and resource consumption, use and disposal – Does the project avoid sending waste to landfill? Is there a high level of recycled content in the building’s materials? Indoor environmental quality – Does the building have low-emitting materials, interior finishes and safe storage of required maintenance chemicals? How much daylight penetrates the interior and are there effective occupant controls on ventilation, heating and cooling? Design innovation – How many truly innovative features were designed into the building? Regional Priority – What geographically-specific environmental priorities are there? Buildings are rated according to a detailed scorecard that is verified and certified after construction. 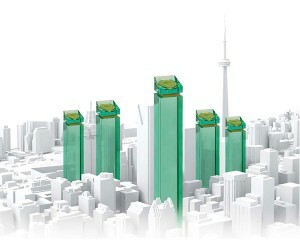 We’ve constructed more LEED® Silver and Gold buildings than any other Canadian builder. But our commitment to the environment doesn’t stop there.